Is the Jelly Bean Update for Verizon’s Galaxy Nexus Popping Up on Devices as JRO03O? Oooh, now this is the stuff we like to see on a Tuesday night. 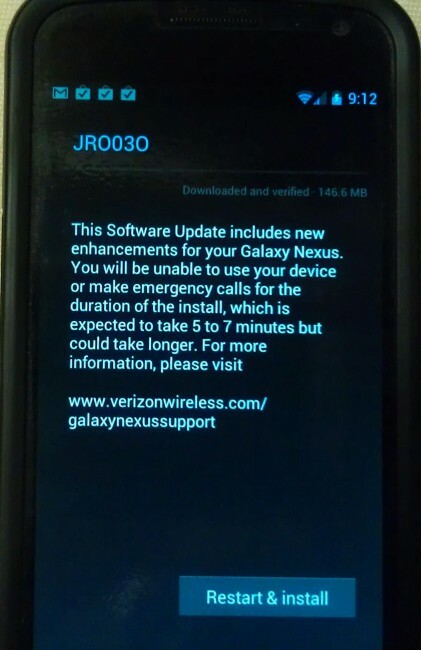 According to an XDA member (same guy that received the IMM76Q update first), a notification for the Jelly Bean (Android 4.1) update on his Verizon Galaxy Nexus appeared this evening. The build number is JRO03O, which would be the newest version of Android to date, and is 146.6MB in size. As you all know, Verizon has yet to announce the availability of this update, even though this is a Nexus device. We were certainly hoping that it wouldn’t be far off after they took their sweet time with the 4.0.4 update, but this is even sooner than I think most expected. Big Red has yet to post official documents for the update, so there is a chance that this is simply the latest test build that one lucky G-Nex owner was able to receive. We’ll be following this story closely. Update: As I mentioned earlier, this is the same guy that first received the IMM76Q update, which means he likely has some sort of a test device. So by no means does this mean that you should be hammering your “System updates” button, but should instead be holding on as the fabulous developer community works with him to get a .zip together or at least a URL so that we can all join in on the fun. Update 2: The file has been found. You can grab it from here.